Buttermere four months ago a cuddle from Knut the baby polar bear was a fluffy nuzzle; these days he's a little more boisterous. And so are his bear hugs. ERF. 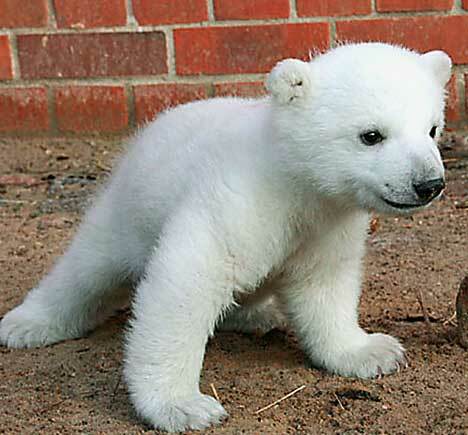 The cub that became Berlin Zoo's star attraction after being rejected by his mother is growing up fast. Keeper Thomas Doerflein, who has been hand-rearing Knut, believes the carefree days of tumbling around with him in his den could soon be over. 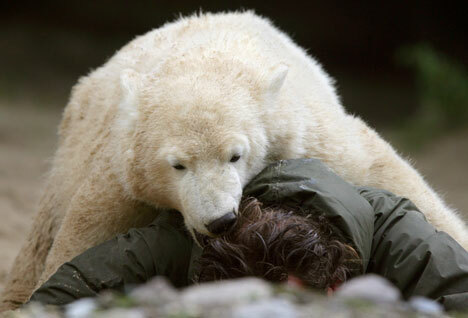 "He now sometimes has temper tantrums when he's hungry or when he wants something and doesn't get it," Mr Doerflein said. "Then he gives me a really good bite. He is, after all, a predator." Here he is eating Thomas Doerflein's skull.